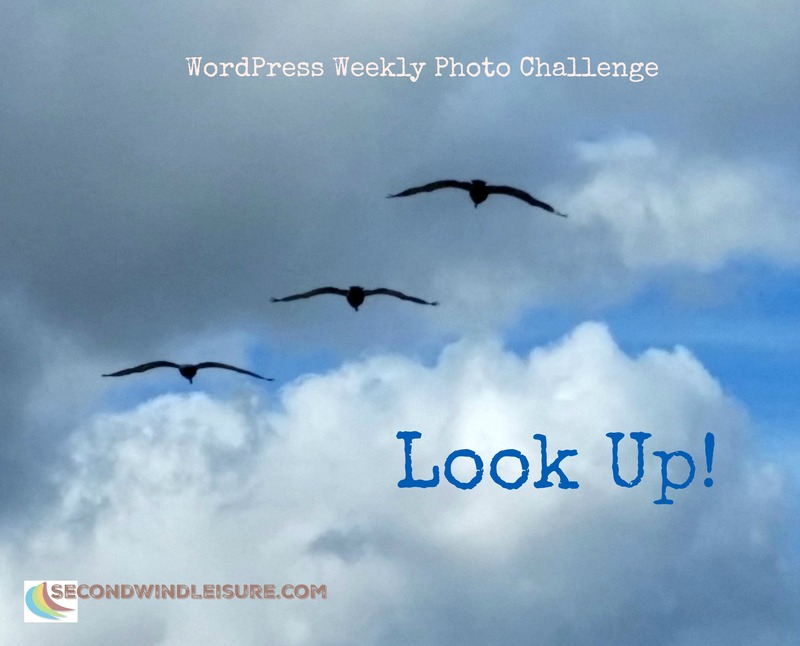 For the WordPress Weekly Photo Challenge, the theme is Look Up. When we take photos, we likely hone in on subjects near or far. This challenge asks us to look up and see what is above our heads. While we stayed in Baja Mexico, there were multiple opportunities to look up and see what was flying above my head besides kites from kite boarders. Seabirds love the warm thermals and float on them all day long. Closer to home, near Sacramento State University, is the Guy West Bridge, built to connect the college campus over the American River with Campus Commons and other neighborhoods. 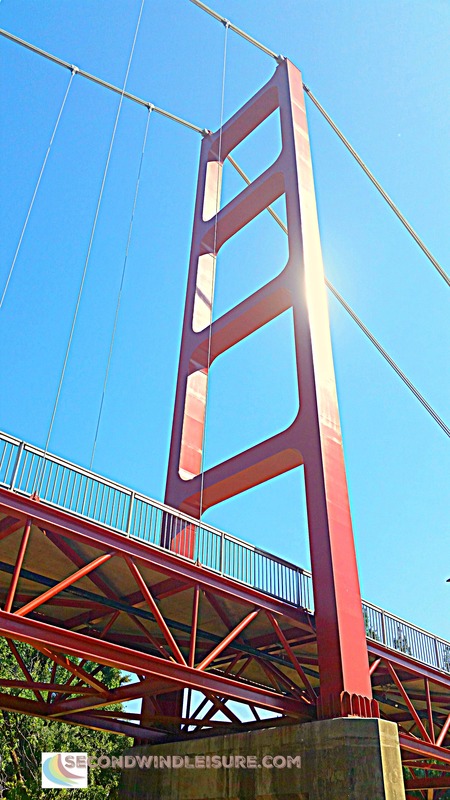 Why yes, it does resemble San Francisco’s Golden Gate Bridge. This was my perspective one early morning from the bike trail. While eating in a restaurant, have you ever looked up at the ceilings? While many modern restaurants seem to have the contemporary look of exposed A/C ducts, my favorite Dim-Sum restaurant in Little Vietnam loves to decorate their ceilings with elaborate chandeliers and other decor. While we were there one Saturday morning, the staff was setting up for a large wedding. I guess the bride really liked pink! These bright streamers covered the entire ceiling. Next time you have your camera or smart phone, look up and shoot what’s there! Feel free to join the WordPress Weekly photo challenge every Friday! Love it. I swear, next time we are in San Francisco I want to head out to the bridge and the area and properly look up there! Nice choices, Terri! I love the streamers. Great photos, Terri! There is a lot of beauty above our heads! Good advice, Terri, and excellent pictures. I’ve been meaning to tell you that I like the new look of your blog. Your profile picture is fabulous. We have buzzards riding the thermals. Always a joy to watch. I love your photography Terri and I laughed when I read Gilly’s comment about the street light 🙂 Such a varied selection, I must look up from time to time. I’m not the world’s best photographer and sometimes I end up with some weird photos of the pavement because I’ve clicked the button accidentally ha! ha! Have a great day! Sue from Sizzling Towards Sixty. Thanks, Sue! Photographers make a few sacrifices for the shot, for sure! Most Asian weddings I’ve been to use red as predominant color so perhaps that was red not pink. Red is for good luck. Must have been a lively ceiling! Last time I did this – I walked into a street light 😦 Just kidding! Great pictures Terri – that is the number one thing I tell my photography students, change your point of view from eye-level! Haha, that would be a photo wouldn’t it? The other day, I found a huge spider and twisted and contorted to get the front of him. I gave up 😁 Thanks, Gilly!